A furnace is an appliance that is part of the heating system; a combustion of fossil fuel and transfers of heat. A furnace can be found in residential or businesses. A furnace can be fueled by natural gas. The air is heated and circulated throughout a building system. A furnace is an enclosed structure in which material can be heated to very high temperatures. A household furnace is a major appliance that is permanently installed to provide heat in your home. 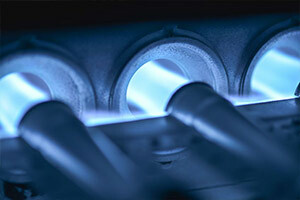 The most common fuel source for modern furnaces is natural gas. Other common fuel sources include liquefied petroleum gas and fuel oil. In some cases electrical resistance heating is used as the source of heat, especially where the cost of electricity is low. Modern high-efficiency furnaces such as Carrier, Goodman, Lennox, Trane and more can be up to 98% efficient and operate without a chimney. A gas furnace or referred to as a forced-air heating system, reacts when the room air temperature drops below your programmed setting on the thermostat. Heat is created, the air is heated and the heated air moves through the ductwork and into the rooms of your home or business. Know the difference between your heating options. At Five Lions Heating & Cooling were here to give you the necessary sources needed in your home or place of work. Take advantage of our 24 hour available service. Call us now and we can book you in for all your needs in repairs, installations, maintenance and more.